Let me guess… Do people keep saying to you “You should write a book!" Guess what? They’re right! 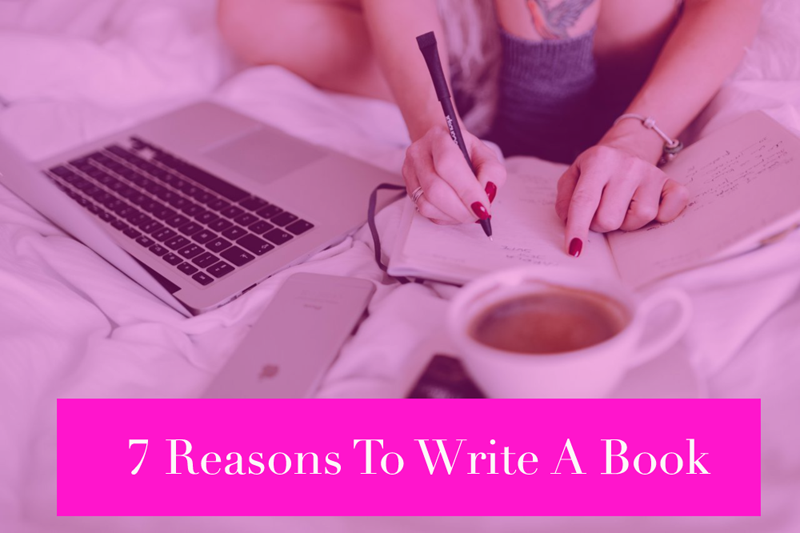 Here are 7 awesome reasons to write your book! 1. Writing a book means you get to position yourself as the expert you already are. So… you already have a deep love and passion for your work and for the message you have to share with the world. You know your subject inside out and you have so much of value to share with the world. In writing a book you position yourself assertively as an expert in your field. You can decide what it is you want to stand for - your unique take on your subject, your perspective, your slant. You claim your expertness with your authorship. An expert is someone who knows a lot about their topic - and you do. To be an expert you just need to be a couple of steps further along the path than the people you help. 2. Writing a book gives you instant credibility. Following on from positioning yourself as an expert, writing a book cements this and gives you credibility with others. You see it all the time when people are interviewed on TV or wherever else “We welcome X, expert in Y and author of the book Z”. You get the idea. This connection between book writing and credibility is in place for hundreds (if not thousands of years). It’s a really valuable asset to leverage in order to gain further publicity, opportunities and grow your business, brand or creative project. 3. Writing a book gives you visibility. Writing a book gives you the opportunity to be so much more visible with your message and your work. It opens up the possibility for connections and collaborations with people who are more established in your area. It offers you the possibility to be featured on all kinds of media - print, radio, tv and online. It offers you the possibility of promotional book tours. Writing a book gives increased exposure to your business, brand or creative project and, not least of all, it gives you interesting and attention grabbing content potential for your social media. 4. Writing a book opens up new career opportunities. In addition to book tours and the opportunity to do courses and masterclasses based on your book subject, a book gives you a springboard to create new career opportunities. Being an author opens you up to being a featured expert in media - or a guest post contributor. Of course a book can also lead to speaking engagements and a whole new career or branch of your career. 5. Writing a book is a revenue stream. A book is a new revenue stream for you, your brand or your business - and even better, it’s a passive income stream. When the book is written and out in the world it’s an ongoing source of potential revenue for you through royalty income. How cool is that? Not to mention all the spin off revenue opportunities generated by your book writing! 6. Writing a book gives you the opportunity to help more people. When you share your message in a bigger way and you reach a wider audience you obviously get the chance to reach people you would not have reached without writing your book. Having a book gives your existing audience another way to sample your work and voice and opens you up to a new audience you may not have connected with otherwise. Think of all the people who can be impacted and helped through your book! 7. Writing a book is a gift to yourself. Through writing a book and stepping up to share your message and your work in this bigger way, you grow as a person. Writing a book is a transformational process and I say this having worked with many, many people on their book writing. Writing a book gives you an even deeper sense of purpose, extra healthy pride in yourself and in what you do, great confidence in yourself as you step up to play bigger, great pleasure in being able to contribute in a bigger way and a fabulous sense of accomplishment overall. And if that all wasn’t enough - standby for next week when I am going to be telling you why writing a book is easier than you think. In the meantime, check out this blog about 5 Ways To End Writer's Block (Without Bullying Yourself)!